We have a contract for the sale of our house! As many of you know, we've been planning to put the house on the market since the spring, but delayed until we had the baby and completed my husband's dissertation research. We've gone all summer without really thinking about it. Saturday, we decided it was now or never. Can't have life get too comfortable, right? Sunday, I called the realtor to schedule an appointment. Monday, I cleaned all day long and into the night. 3:00 am--Baby wakes and refuses to go back to sleep. I spot clean carpet wearing sling. 7:00 am--Baby finally sleeps, just as Andrew wants workbook time. 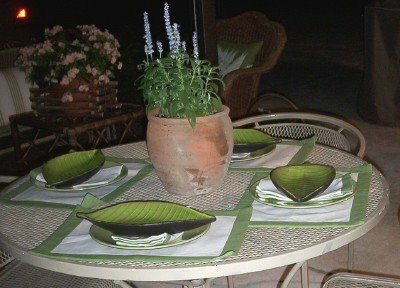 I dress up the patio for photos and blow off the driveway. 11:00 am--Realtor comes to sign listing agreement. We decide to begin showings at a kickoff Open House on Sunday. We write the brochure text and take photos. 1:00 pm--Cave in and buy lunch to go at Captain D's. I'm too tired to drive farther down the street. Bad, bad dieter. 2:00 pm--Lulled by fatty food, I decide to take the afternoon off. I have a few more days left to clean the burner pans and scrub the bathroom grout, anyway. 5:00 pm--Agent calls. Prospective buyer saw internet photos and is desperate to come before the open house. Can they see it in an hour? 5:15 pm--Greet husband at the door with a baby attached to one breast and a bottle of Windex in my hand. Help! Load the bouncy seat in the trunk of the car while I pick up the mess from an afternoon of unsupervised four-year-old mischief. 6:00 pm--Move the cars to Burger King and have another unhealthy dinner. Who can eat with this stress, anyway? 7:00 pm--Agent calls. Praise God! We have a full price offer! Return home to initial changes to the contract and make copies. 8:00 pm--Go to my agent's house to babysit for an hour while she makes up a dinner meeting she missed during all the commotion. Did I mention my aunt is the best agent ever? 10:00 pm--Home again. But not for long! The house still has to pass an inspection and the lending, finalized. We should know in two weeks whether this deal will work out. Our biggest worry is that the aggressive price might exceed the bank's appraisal. But I'm still humbled and heartened by the quick response! Hopefully finding another buyer, if necessary, will be similarly easy. This is exciting and wonderful news!! Isn't God good? I laughed as I was reading this entry because it reminded me of when we sold our first house when our oldest son was about 1 year old. I remember that before every showing, (and there were only a few, but it seemed like a lot with a baby! ), I would get up very early, get everything immaculate, and then go somewhere for the WHOLE day just so he wouldn't mess anything up! Yep, I understand hanging out at a McDonald's-type place so that you don't mess up the kitchen!! I am thrilled for you and your husband, and hope that everything continues to fall into place with this buyer. No doubt, she was attracted by all the beauty you have created in your home! Congratulations!!! I am so jealous! I've sold 5 houses, but never sold in that kind of time frame! I am very happy for you, and hope all goes well!!! Congrats on the super-quick sale. I hope everything else goes as smoothly. I also just have to let you know how much I enjoy your blog. It's a great reminder to me how to see God in even the smallest things. WOWZERS! Amazing! I hope all goes well for you guys. Thank you! Keep your fingers crossed! *Now* my agent says perhaps we should have listed it just a little bit higher! Oh, well, it's not outrageously priced, but the existing "comps" (comparable home sales) were low for our neighborhood. We asked $125 a square foot, where my neighborhood averages $80/sq. foot. Right now the market for entry-level ranch homes is hotter than anyone expected. As long as the bank recognizes this recent surge in prices, we should be fine. That's great! I've enjoyed seeing the transformation of the house as you've given it the special touches that make a house a home! How wonderful!! I am so happy for you. Now it's time to find the next house and make it your home. Praise God!.